Arrossim Beach, Cansaulim, South Goa - 403 712. 15 Kms. from Airport, 17 Kms. from Railway Station. Hotel Park Hyatt Goa Resort and Spa, Goa is situated on Aguada Bay and is located in Panaji. 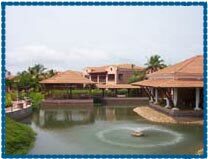 Hotel Park Hyatt Goa Resort and Spa, Goa is spread well over six acres. The hotel reflects Goa's rich cultural heritage in design and brings a new vision and standard of hospitality to the Indian sub-continent. 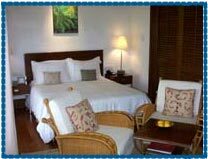 Hotel offers a spa that is known for offering some of the best massages in Goa. The Ayurvedic treatments and the new-age therapies that are offered in the hotel are done by some of the most well trained specialists and are guided by a specialist Ayurvedic doctor. A total of 251 rooms and suites that are offered by the hotel are one of its kind. All the rooms and the suites have been loaded with the best of ammenities. Guest rooms are spacious and stylishly contemporary, with large open verandas or balconies. The unique open-plan marble bathrooms combine the qualities of a personal spa with sunken baths and rain showers. Many of the bathrooms overlook miniature "secret gardens", and some have an outdoor shower hidden among the foliage. Outdoor Pool, Satellite TV, Safety Deposit Box, Wake Up Calls, Post, Pool, Swimming Pool, Gymnasium, Laundry, Medical, Internet, Travel Desk, Barber Shop, Currency Exchange, Camp activities for Children, Video Arcade, Water Sports, Badminton, Croquet, Beach Volleyball, Multipurpose Theatre, Room Service, Parking, Barber.